Not really surprised. We continue to hear of reports of them. There are some rugged mountains down there. Sounds like someone might have released another mountain lion. It is illegal to keep a wild animal, like a mountain lion, as a pet without a license from NYS and the federal government. There has been a steady movement of mountain lions moving from the west to the east. But, recently they have seen them stop in the movement east. But, there are some up in Canada. Over time, they probably will make it from the west to the east. I wouldn't say that it is impossible to have a migratory one show up in the west, but it would be surprising. So, most likely, this is most likely a releasee. We have found numerous coyote kills on the Kaaterskill Mtn Range with fur shearing, which is typical of mountain lions. Cougars are quite good swimmers, and can easily swim across the Hudson River. They are capable of running 50 miles in a single run, and can travel several hundred miles in one day. 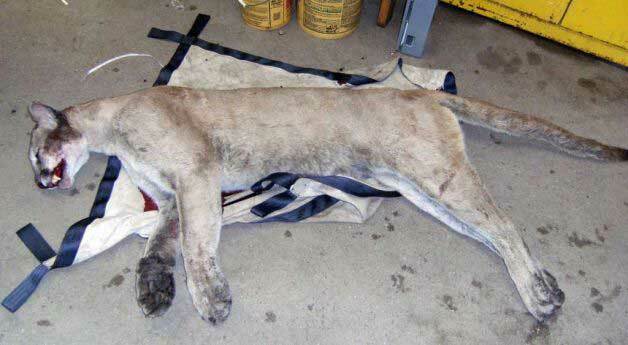 We also had a report last Fall that a mountain lion was killed in Columbia County. The person who killed it was fined $1500 by the DEC. We could not confirm this report. It may or may not be true. They are now reporting that the cougar was 140 lbs. Nice size mountain lion. He looks rather thin, and the tail looks thin. And to boot, there was a sighting last year in Oak Hill of a female cougar and a cub. I see the CT DEP is on the steady denial path. Mountain Lions can swim quite well. Much better then humans. Water is NOT a safe place to go to get away from them. No problem swimming the houstonic river or the hudson river. So much for all the denial we have had over the years about NO mountain lions. Then it was show us prints and photo evidence. You showed them tracks, with denials. Now, we have photo evidence and the denials keep coming. Milford is about an hours drive from Greenwich... ,I know cats have good stamina and can go far but that would mean the cat would have to travel 10 miles per day to get there since the initial sighting in Greenwich was only 3 or 4 days prior to where this cat was found dead. Even for a cat thats a lot of distance to travel, and I don't see the motivation for it travelling so far... there is plenty of deer around Greenwich/Westchester, plenty of food including occasional roadkill and trash. A mountain lion can run from Greenwich to Milford in a couple hours. No problem for them. They can travel a couple hundred miles a day, and can run at 18 mph for 50 miles straight. They can leap 40' in a single leap. They can easily jump up 20' high onto a ledge. They have incredible movement skills. Has anyone heard if the killed cougar is a male or female? the mountain lion did appear thin, but it did weight 140 lbs. I'm not sure if it is male or female. The real issue in the discussion is if there a viable breeding population of mountain lions in the NE. That is the ONLY thing that really matters. It doesn't matter where they came from. If a male and female are breeding and the offspring survives and breeds, then we have a population of mountain lions. It should be noted that we did get a report from someone last year that they saw a female mountain lion with a cub in Oak Hill, NY last year. 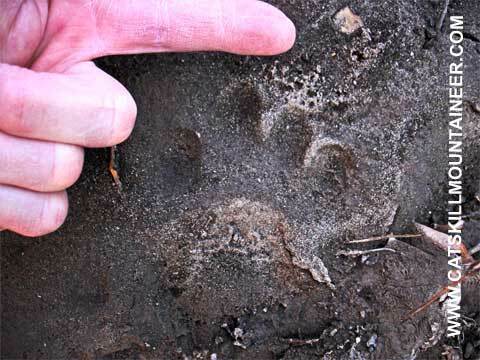 The person reporting it had lived in Montana and had seen many mountain lions before. Until we get a picture, we cannot say for certain that they are breeding. We have heard many credible reports that in 2001 the DEC released close to a dozen Mountain Lions in Rensselearville, NY. The DEC denies this happen. Since 2001 the number of reports of mountain lion sightings seems to grow. I would venture most of them are wrong. We have had a small number of sightings from biologist and other credible people. 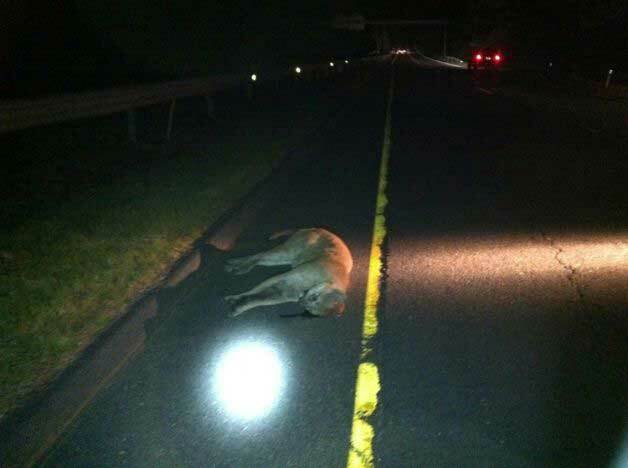 We know that one mountain lion was removed from a farm in Coxsackie. We also heard reports of one removed from Columbia County last year. We have tracks from the Kaaterskill Clove with numerous coyote kills with hair shearing. We also saw deer kills with broken bones, broken necks, punctured skulls. Even if these Mountain Lions are escapees, if we get a male and female breeding, then we will have a population of mountain lions in the NE. It will not matter if they are escapees or where they came from.